Being a participant of the EXCEL program in Chek Jawa has been a most invigorating and fulfilling experience. I cannot exactly explain how I came to experience such pleasure in exploring Chek Jawa, except that such a delightful place must indeed stir up a passion for life. I remember how there was a large protest against the Singapore government to keep Chek Jawa from being reclaimed. Environmental activists petitioned that Chek Jawa should remain as it is. The end result was successful and the government relented in keeping away their plans for an urbanised Chek Jawa. Such a story piqued my interest in joining the environmental EXCEL program. There was unorthodox leadership in this – meaning that a non-conforming yet passionate leader rose up to defend the helpless lives of Chek Jawa. This speaks more than any leader in a guaranteed position because this leader believed strongly in his ideals, even if it went against economic and national progress logic. Although many leaders lead well, they lead accordingly to pragmatic and practical reasons for meritocratic progress. However, I believe that outstanding leaders are able to lead with such excellence because they will not compromise their values for just a practical or economically beneficial reason. I consider these leaders abstract, because they do not lead out of duty, but they fulfil and yet fuel their passions. With this, they do not merely pique interest in their followers, but they inspire similar value systems in them. The above paragraph captures my thoughts on the talk that Ria gave. Though she was not the first to discover and protect Chek Jawa, she was quickly caught in the whirlwind of preserving wildlife, an ecosystem untouched by human civilisation. She became the fervour to arouse enthusiastic individuals who will share her passion. What a force of leadership she is to be reckoned with! My first trip to Chek Jawa was an eye-opener for me. It had been eons since I last stepped onto Pulau Ubin, and my senses towards Nature have already been dulled by too much of a familiarity with concrete, stone and tar. I was attached to Ley Kun, who took me in as a co-tour guide with her. A European family followed us on this tour. Quite very quickly, I became friends with the 2 young daughters of the family. Guiding a small group has its advantages. Initially, I hoped for a big group, so that I could blend in together with the crowd. However, I thought that that was not what I should be doing. I ought to be taking the first step to initiate the family into experiencing the joy of Nature in Chek Jawa. Now, this proved to be quite a feat, as it was also my first time at Chek Jawa. So how was it possible for me to impart a passion I had yet to experience? But this I knew: I chose to come to Chek Jawa because it possesses a value which few can see, and even if many saw it, they could not internalise it. Such a value of life is intangible and mmeasurable by any indicator of success. I had a liking for Nature, but I didn’t yet know how much I loved it. This pre-conceived idea of delving into a relationship with Nature helped me very much to speak forth my interests in this area. Figure 1 Family who toured with me on my first guiding experience. The elder daughter was roughly my age, while the younger one was about 7 years my junior. To connect with the family, I found that the easiest way was through bonding with the daughters. While I spoke more easily with the older one and discussed studies at length, the younger one was significantly chattier and enjoyed mimicking the sounds of Nature, often making bird calls and the likes. This did not really bother me at all, but it did give me an insight into their family dynamics to further understand them and guide in such a way to cater to their needs. 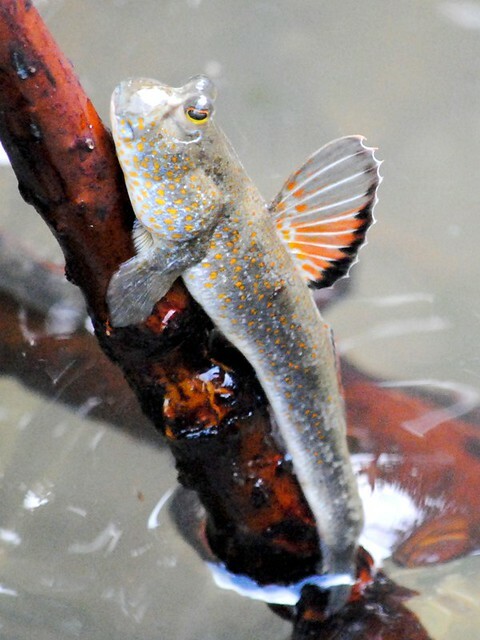 Figure 2 Mudskipper showing off his gill. We saw many things that day; mudskippers that were hard to spot, crabs in the lobster mounds, a ‘sea’ of tiny red claws waving atop seaweed on the beach, a huge ant weaver’s nest, etc. All these creatures were so full of life, each an embodiment of Nature’s great work of hands. As I spent more time opening up my senses to the environment around me, my senses grew keener and sharper, which readily aided me to follow up clues to look where that crab or that mudskipper might be found. 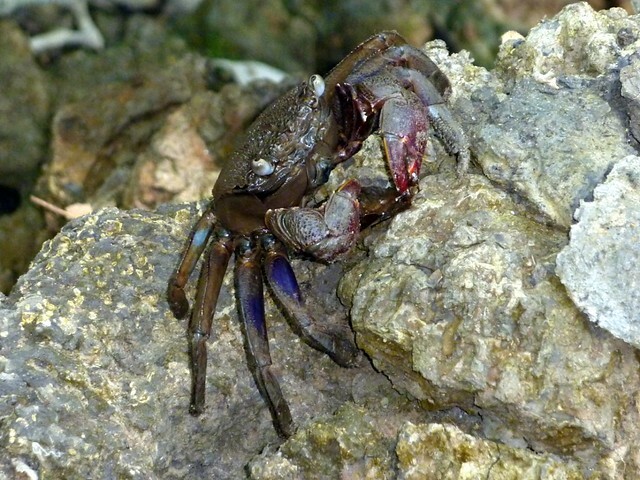 Figure 3 Crab on the lobster mounds. This proved true indeed on my second trip to Chek Jawa. It was much easier to point out mudskippers (even the different types of them), camouflaged crabs against a brown background, monitor lizards, snails and the ant weavers again. Well, it was easier for me, but my capability fell short of children’s naturally superior touch with Nature! One of the little boys who was on the same trip as me told me that he counted 20 mudskippers, 10 crabs and 4 monitor lizards! His eyes must be keen as an eagle’s. 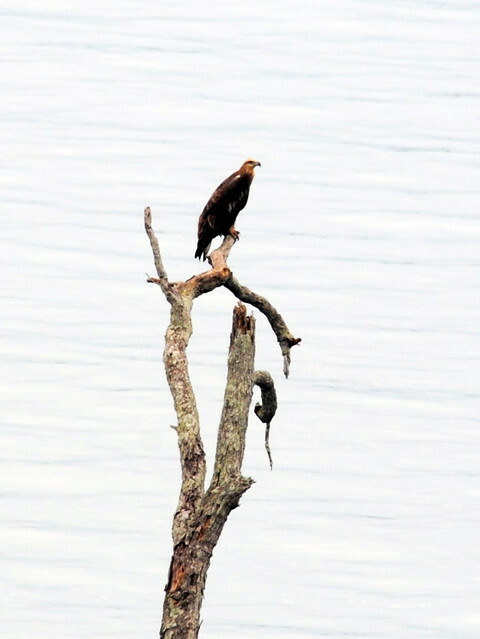 This reminds me, that we saw a white-bellied eagle perched atop a withered tree rooted in the water. Such a splendid sight called to my mind a scene from Lion King, sweet reminiscing of a childhood past! I followed Ria this time round on my second tour, with 2 families to guide at hand. One of the families was based in Singapore, but they came from England. The other family was Malay, who loved Chek Jawa so much that they came back twice in a week just to see and learn more about it! They English family was a large one, with many children. The Malay family was smaller, but they had a disadvantaged child who needed to walk at a slower pace. Yet, she persevered even when she became tired and she neither complained nor showed any signs of giving up. Her bravery for life is worthy to be admired! When the English family walked on at a faster pace ahead with Ria, I stayed behind with the Malay Family and guided them through. Fortunately, they seemed to be familiar enough with Chek Jawa to be at ease. One of the little girls even brought me to a rock she found on her previous trip to see the beautiful purple flowers which grew in the cracks there. As I stayed with the family, I could sense their appreciation which they showed by wanting to share their snacks with me, though I declined. From a leader’s point of view, I felt that everything was all the more worth it, because the people whom I led understood what I was doing, and they showed their appreciation for that. A weird exchange you might call it, but I suppose such acts of reciprocated kindness give leaders the motivation and strength to strive for excellence in their leadership. In this trip, I too ‘officially’ talked about some parts of Chek Jawa, and I had to actively engage the 2 families in the stories I was about to tell. Before I came to the parts I was supposed to share about, I tried to engage every participant on an individual level, and more importantly, grasp an understanding as to how passionately they felt about the environment. I found teasers an extremely useful tool to pique the adults’ interest. Both fathers in my tour group were intrigued by my challenge on them finding out what material the boardwalk might be made up of. Children loved a descriptive story of the frog island while the mothers enjoyed learning factual biology which they could reiterate to their young ones. 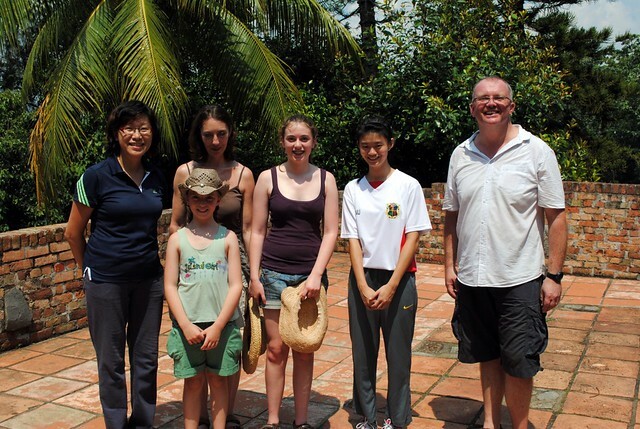 Understanding the dynamics of a family helped me to lead them effectively. Most oftentimes, I find that mandatory leading is unnecessary. In this case, I feel that ‘guiding’ would be a more suited term to describe my leadership experience with these families. Indeed, as Ria has said, a success indicator of our tour is how much every one of us has enjoyed it. I enjoyed my trips tremendously, just as I believe the families had enjoyed them too. Leading is a blessed thing to do, and I’ve been made to realise that it can exist in passion - joyful to delight in!